Rising to prominence in the early 1960s as one of the first hard edge painters in Europe, known for his vibrant and colorful works, Georg Karl Pfahler was an internationally recognized artist who represented Germany at the Venice Biennale in 1970 alongside Günther Uecker, Heinz Mack, and Thomas Lenk; and at the São Paulo Biennale in 1981. Pfahler was born in 1926 and studied at the Kunstakademie Stuttgart under Willi Baumeister, graduating in 1954. Initially working as a sculptur, it was Baumeister who encouraged Pfahler to focus on painting. Influenced by the tradition of European art informel, he quickly simplified his paintings to adopt an innovative abstract geometric painting style, with block-like forms on crisp backgrounds appearing on his canvasses as early as 1962. It was then that Pfahler continued to reduce his style even further to exclusively focus on the dynamic between shapes, and to examine the deeper relationships between space and color. In doing so Pfahler became a thought leader and one of the first European artists to simultaneously work in action, color field, and hard edge painting—styles that his American contemporaries like Frank Stella, Ellsworth Kelly, Kenneth Noland, and Leon Polk Smith, among others, explored as well. By the mid 1960s Pfahler had arrived on the international stage. Exhibitions such as “Signale” in Basel, Switzerland in 1965 contrasted color field artists from Europe and the United States. Pfahler showed his work alongside Al Held, Elsworth Kelly, Ken Noland, and Jules Olitski, and the critically acclaimed show cemented his status as a leading European artist of his generation. In 1966 Pfahler had his first show in the United States, where Barnett Newman curated his exhibition at Fischbach Gallery in New York. Then, at the Venice Bienale in 1970, Pfahler created one of the highlights of his career to much acclaim; a walkable structre that allowed visitors to physically experience the shape, color and spacial context that is central to his work. 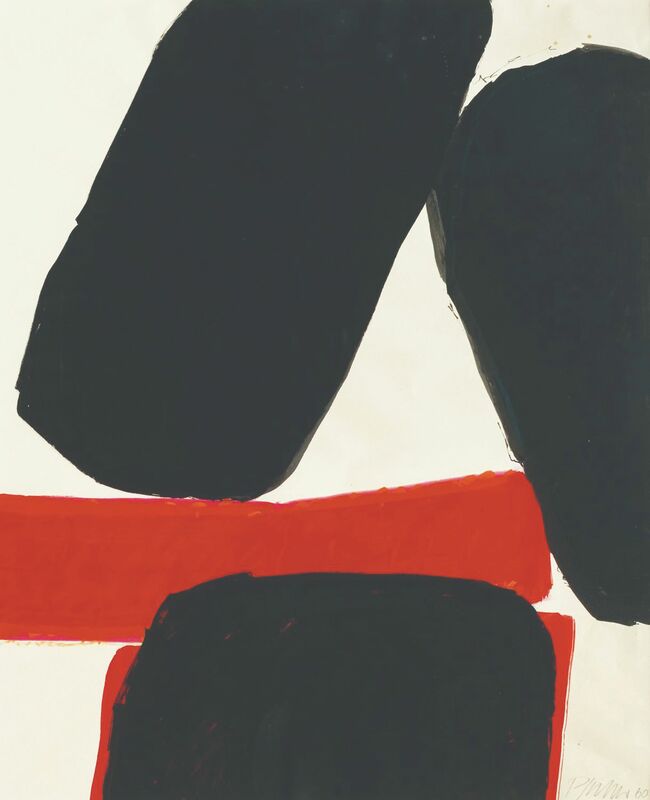 In the late 1970s Pfahler’s work began to take increasingly gestural forms, introducing sweeping blocks of colored shapes set against minimalistic black or white backgrounds, a stylistic preoccupation that continued to influence his work throughout the 1980s and into the eraly 1990s. By the late 1990s Pfahler’s compositions had progressed into a new and final direction, where a greater number of forms, layered on top of each other almost like a collage of colored shapes are distributed across the surface of the canvas, adding a new and never before seen spacial dimension to his paintings. Pfahler dedicated his entire career to the investigation of the relationship between color, shape and space, an objective he steadfastely pursued until his death in 2002. In doing so he was—and remains to this day—at the forefront of the color field painting movement, creating an impressive depth of work that is represeneted in several important private and public collections around the world.